We stopped at Mojo’s coffee shop to have breakfast (the 2+2+2 is amazing consisting of two eggs, two strips of bacon and two plain, blueberry or chocolate chip pancakes). Ashley was our cashier, barista and servers Mojo’s for the two days we stayed in Damascus and was so patient handing out plates of food to dozens of hikers at once. 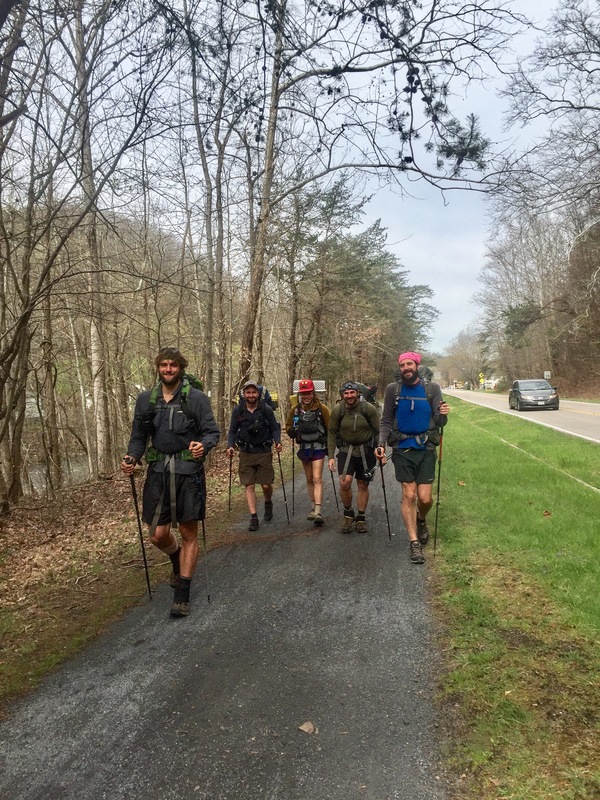 We only had 15 miles to hike to Lost Mountain Shelter when we left Damascus, VA. Not a bad day especially after a zero. 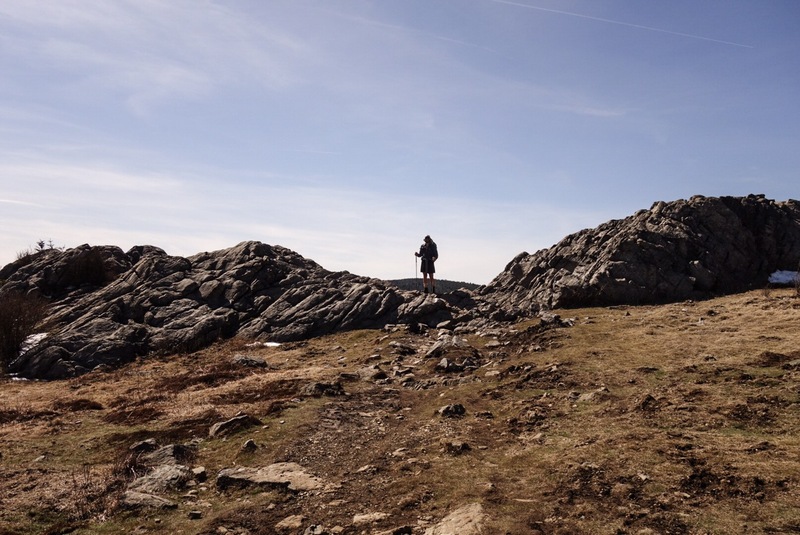 With our packs full of our resupply and our bellies full of town breakfast, we set off. It’s always hard to hike out after doing a zero. The exhaustion has a chance to catch up with you and your body feels sluggish and sore. But, since we are here to hike we had to move on. It was a sunny, cool morning that soon warmed up as the hours passed. There were tons of creeks weaving in and around the trail, including a river crossing we had to remove our shoes for. Thank you, Diane Karch for my purple Crocs that proved quite handy in that situation. Darwin had some troubles with his leg but he stayed calm and stopped throughout the day to adjust his ace bandages accordingly. I had some back and shoulder pain that’s hard to describe. Imagine someone is pinching your muscle on certain points on your shoulder blades and neck while also poking it with a needle. Every morning this happens and I’m not sure why. Darwin helped try to adjust my pack, which did make it more comfortable but did nothing to help the pain. Oh well. Usually by late morning or early afternoon the pain stops, maybe my back has had time to adjust? Who knows. “No pain, no gain, no Maine” as they say. Darwin being the mountain beast that he is. At some point that day I forgot my electronics bag next to a sign where we took a break. I hadn’t noticed until Strider came to the shelter and said, “hey, Legs? I think you forgot something.” It was nothing important: only my wallet with my ID and cards, camera, headlamp and various charging chords. Big oops there. Thank you, Strider for being you and not being a random person who could have easily stolen all of it. The next day we were late getting out of camp but enjoyed the sun heating up our shelter and hammocks. Darwin and I headed out listening to the final Artemis Fowl book in the series with only 18 miles ahead of us. A solid 2,000 foot climb awaited us that stretched over two miles or so. 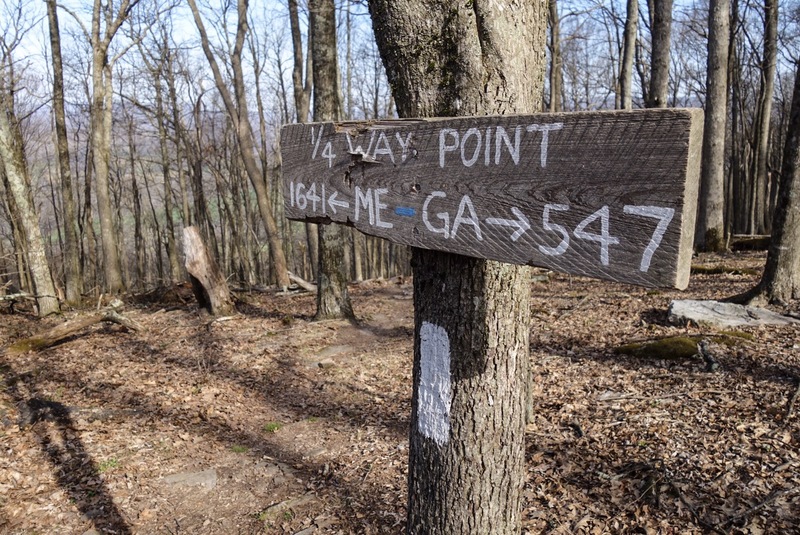 It’s not a fun way to start the morning off but it was graded nicely with long switchbacks to Buzzard Rock. To top it off, some wonderful people gave us some trail magic consisting of chips, chocolate, bananas and soda when we arrived at Elk Garden. 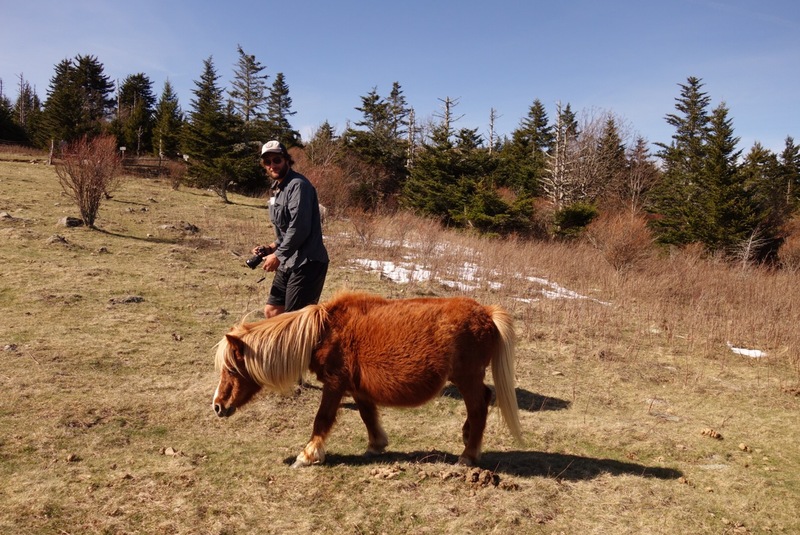 It was in Brier Ridge where we saw our first wild Grayson Highland ponies! These furry almost over sized puppies came right up to Darwin and me so naturally I held out my palm and allowed this adorable, grass smelling creature to sniff and lick my hand. Such a cutie. 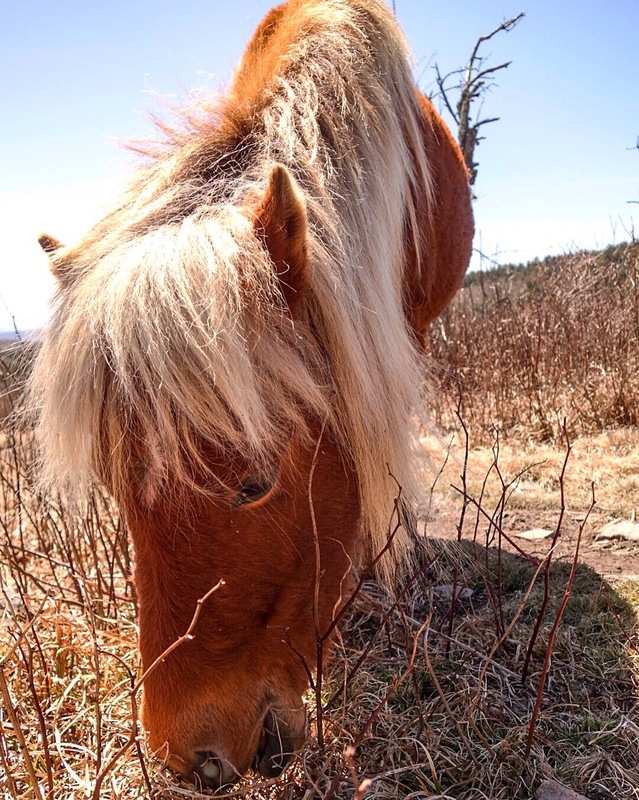 When we officially entered Grayson Highlands State Park, we saw more ponies and more gorgeous views of the highlands. We crawled through the Fat Man Squeeze, a small, dark cave walk that had lots of ice. The rest of the Highlands were gorgeous with exposed rocks, ponies sprinkled here and there, and golden sunshine to warm our necks as we passed the 500 mile mark. We arrived at Wise Shelter where at least 5 ponies joined us on our way to get water. At this point it was ridiculous to think seeing a wild pony would be a treat because it turns out they are everywhere and are not at all shy to come up to you looking for a quick treat. No, I did not feed them but it was obvious they were used to it from other thousands of people who visit the park. Later that evening, those same ponies from the water source surrounded us at the shelter, begging for food like the big, furry puppies they are. They licked our hands and we gently stroked their manes and ears. The Machine mentioned he wanted a pony to lick his freshly shaven head earlier that morning as somewhat of a joke. 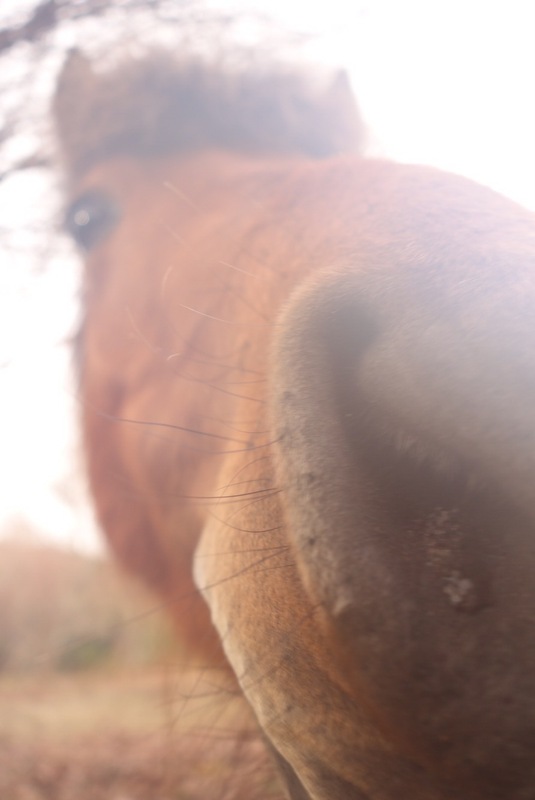 But down he went, allowing one of our pony friends an opportunity to get a few licks in – yes we have video proof. It was awesome. 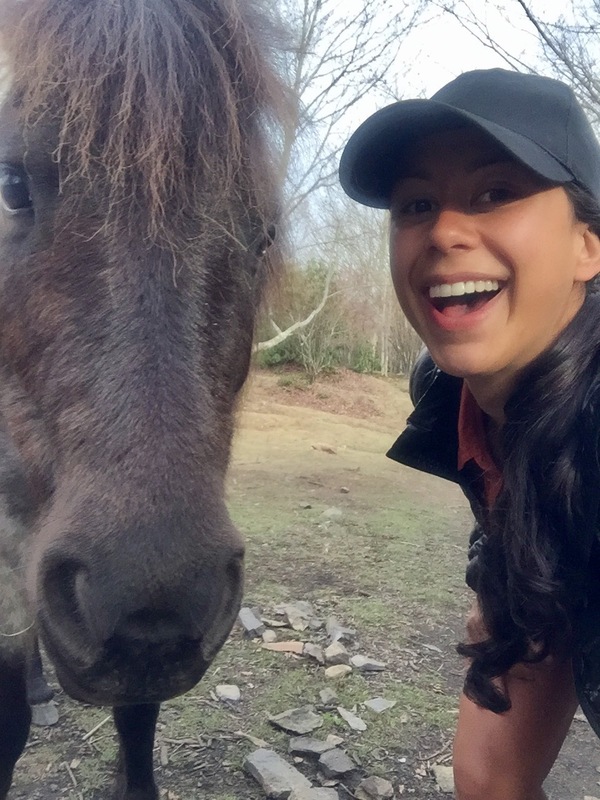 The following morning we said our goodbye’s to the ponies, let them lick our hands, I took a selfie and set off for Trimpi Shelter. We had a 20.1 mile day so I took my time in the morning, pacing myself for the long day ahead. The trail itself wasn’t terrible. Steady ups and downs with roots and rocks to bruise the palms of my feet. Luckily, the sun and hot air during the day made our spirits high. We enjoyed long breaks for snacks and water, putting our feet up to drain the lactic acid from my legs. Darwin and I finished the Artemis Fowl series by the time we rolled into camp a little passed 5pm. We got to the shelter and immediately sat at the table to eat, letting the miles settle in to our aching muscles. 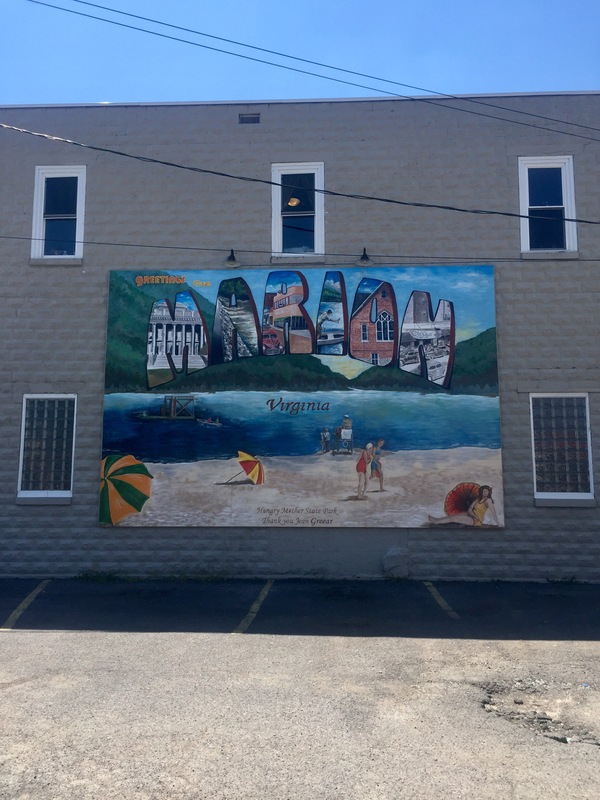 We knew we would hike through Marion, VA the next day. With town food on our minds, we smashed the 10 miles to the road crossing, finishing in only 3 hours. Wet Wipes, Strider, Darwin and I ate Japanese food after receiving a hitch from a recently licensed, 16 year old boy. He said some low key antisemitism comments that we subtly questioned but left alone. Had you seen how fast he was driving down these mountain roads you would leave it be as well. We arrived at Yummy Yummy, and all commented about how strange the farm-raised youth was, concluding that he most likely repeated whatever racist comments his parents may have taught him. There’s no sure way of knowing. Glim-Glom and Honey Badger caught a different hitch, apparently riding in the back of a truck bed, and met up with us for food. After stuffing our faces with gyoza and chicken teriyaki, we mailed some winter gear and other unnecessary items home to lighten our packs. Then, just after Darwin finished illustrating a sign saying “hikers to Walmart” with our always readily sharpie, we got a free shuttle ride from a man heading that direction. Easy peasy! I resupplied at Walmart and Ingle’s, which were conveniently next door from each other. The Ruff Necks sorted various food items while sitting in the middle of the walkway between the two super stores. I got up to throw away all the empty boxes of gummy snacks and chocolate assortments when all of a sudden an older man with a limp came up to me and said, “Do you need glasses? These guys are ugly!” Confused, I just looked at him with a blank stare. I heard uncomfortable giggles and sarcastic thank you’s coming from my group and I just walked away without saying a word. These towns always have some strange characters. After a full resupply we decided we were hungry again and we went to the Mexican restaurant down the street called Mi Puerto. My nachos were soggy but tasted ok while Darwin’s tacos asados looked delicious. I definitely recommend those instead, looked way better. We hitched out of Marion and back to the trail with a nice, older couple eating near us at the restaurant. They managed to stuff all 6 of us and our packs in their mini van parked outside, asking us questions the entire car ride. We set up our gear at Partnership Shelter just passed the visitor’s center, full of town food and ready to pass out. Last pony photo, they are just so cute!